My friend Nikki is a food writer and photographer. She produces a beautiful website: art & lemons. That amazing photo above is hers. I have been lucky enough to spend some time with Nikki in her kitchen. What I noticed right away is that she is smiling when she cooks. That’s right! She is calm and happy as she does the kitchen tasks that lead to a delicious meal. I found this behavior fascinating because if you walk in my kitchen when I am cooking, you will see a frown. I don’t relax when I cook, but I wish I did. I’ve always been curious about cooking as both a technical and creative art. Being in the kitchen is like meditating for me. Everything gets still and quiet and as I pour olive oil into a pan, chop an onion, and begin the dinner ritual. There is something very meditative about cooking for me because I have to pay complete attention to the present moment and to everything my senses are experiencing. That's when I know the food will taste good. Ummm, yeah. You mean you aren’t trying to check your e-mail, listen to the radio, stop your daughter from hitting her brother, and cook? I decided we could all learn something from Nikki and she was kind enough to give me an interview and an amazing recipe for frozen yogurt. Snack Girl: When did you learn to cook? Nikki: I remember cooking eggs in our galley style kitchen around age seven. It was a perfect fit for just one and I was always the first one up. I started with eggs, scrambled then poached then folded over into loose omelets. Pancakes followed. I suppose I got my start with breakfast. The kitchen was quiet and cleaned up from dinner the night before and it always felt like an inviting place to be in the mornings. Snack Girl: At what point in your life did you realize that you found it to be relaxing? Nikki: Cooking has always been relaxing to me. I think it’s because I was never intimated that something would flop. My curiosity kept me interested in the science of cooking. Something always flopped in the beginning. I made up recipes for cookies that were more like oil blobs. They ended up getting thrown in the trash, which frustrated my mother that I was wasting food. For me, I was learning how to cook by experimenting in the kitchen. I spent hours watching both of my grandmothers cook. There was a natural rhythm and energy to boiling a pot of water, mixing a cake, or frying potatoes that fascinated me. I wanted to do the same. To move effortlessly from dish to the next. Snack Girl: What is your favorite cooking task? Nikki: My favorite cooking task, hmm that’s a good question. Whisking simple vinaigrette together to dress a salad or making a loaf of good bread. Snack Girl: Are there times when you find cooking to be stressful? Nikki: Yes, cooking can be stressful when I take on too much at once. I tend to have grand visions of lavish fancy dinner parties and whenever I host such a dinner with multiple courses, I get a little edgy and overwhelmed. I know this about myself now after having done it enough times. I can pull the dinners off without a hitch but I don’t enjoy them as much. I’ve learned to design simpler menus where I can prepare parts of the recipes in advance. I’ve also learned to ask for lots of help. Nikki: Olives, roasted red peppers, artichokes, cheese, crackers, hummus. This coconut vanilla frozen yogurt is a favorite in Nikki’s house! Check out her lovely blog for more great recipes: art & lemons. To strain the coconut milk, line a mesh strainer with cheesecloth or a layer of paper towels. Slowly pour the coconut milk into the strainer (You’ll need to buy 2 cans, but will only use about 1 1/2 cans. You can stir the leftover coconut into steel-cut oats, pancake batter, or quick-breads); then refrigerate for an hour. Flatten the vanilla beans and cut them in half lengthwise. Scrape the seeds from each half with the flat edge of a knife. Mix the coconut cream, yogurt, and sugar together in a medium-size bowl. Stir until the sugar is thoroughly mixed in. Add the vanilla bean seeds and shredded coconut. Cover the bowl and refrigerate for 1 hour. Transfer the mixture to an ice cream maker and freeze according to manufacturer’s instructions. (This recipe is inspired by Heidi Swanson’s Vanilla Frozen Yogurt). Thank you for this invitation to experience the calm joy of cooking. I notice that I enjoy cooking the most when I am not hurried. And sometimes I think I'm hurried when I'm not really. Great post! Something to strive for, that's for sure. My 2 favorite parts were, "Ummm, yeah. You mean you aren’t trying to check your e-mail, listen to the radio, stop your daughter from hitting her brother, and cook?" LOS! THAT IS TOTALLY ME. My 4 and 7 year old boys have turned me into a perpetual referee. Oh well! The 2nd fave line was "I’ve learned to design simpler menus where I can prepare parts of the recipes in advance. I’ve also learned to ask for lots of help." That is pure wisdom that I have learned in my years of cooking, too. Oh so important to remember, which I don't always. Thanks for the insights and the post. Very nice! Good recipe, too. I'll have to try that. Wonder what the substitute would be if you use vanilla extract? I never have a vanilla bean in my kitchen. Wow! Calorie sticker shock. 154 calories for 1/4 cup! 4 tbs.! 11.2 gr of fat! That more than Haagen Das! I was wondering if you could use "lite" coconut milk? Coconut milk is high calorie, but is a very healthy fat. Farmers fed it to their cows hoping to fatten them up , but they lost weight instead ! We need fat in our diets and this is the best one. I put it on toast every morning instead of butter. Hi Lisa, Thanks for the interview and chance to chat about cooking with you! It's always fun to spend time with you in the kitchen...I thought I would address a few questions as well. Angie—Ha, well my kitchen is like that too sometimes! Yes, you can substitute 1 teaspoon of vanilla extract for the vanilla beans. Lyda and Sue—As Elaine mentioned (Thanks, Elaine!) coconut milk is a healthy fat. In this recipe, whole coconut milk is strained to make coconut cream which doesn't work with lite coconut milk since there isn't enough fat in it. Yes, you can use lite coconut milk. If you're looking for the lowest calorie count in this recipe, you can try 0% fat yogurt (but 2% will taste much better!) as well. Obviously making these substitutions changes the richness of the recipe and it's often the case when fat is removed more sugar is added to increase flavor. I would keep the amount of sugar as is though and change the yogurt and coconut milk proportions to 2 cups of Greek-style yogurt and 1 cup of lite coconut milk and see how it tastes. I would love to hear how it turns out! I will try it with the adjustments and let you know. Thanks. Arg!!!! 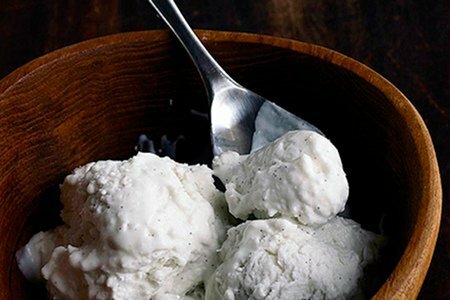 I was so excited about this recipe until I saw that you need an ice cream maker! Is there anyway to do it without one? Made this over weekend with light coconut milk and 10% fat greek yogurt (1 cup milk/2 cups yogurt) and coconut sugar as I don't use regular or artifical sugar. It turned out great. Sue, I'm so happy it worked out and I'm going to try my next batch using coconut sugar (thanks for the great idea)!